Another yummy Dough Ball Cookie Recipe with more to come!!! I used Bob's Red Mill Hazelnut Flour/Meal found at Whole Foods, Vitamin Cottage and on Amazon. Any brand will work. You could certainly make these with almond flour as well. 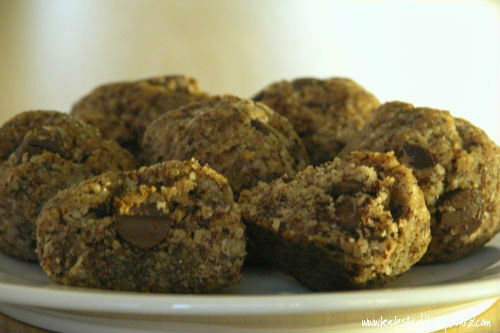 The hazelnut flour added an additional bit of sweetness and tasted yummy with the chocolate! Look out, these are addicting!!! Good thing they are grain-free and gluten free!! They can be close to sugar free if you use Nature's Hollow Maple Syrup and higher cacao content chocolate. I have recently switched all of my skincare and makeup to a company that is free of 1,500 chemicals!! I am so particular about what goes into my body, I need to be just as picky as to what goes on my body! Your skin is your largest organ and absorbs chemicals into the bloodstream faster than the gut does! I am vain when it comes to my skin and was so thrilled to find products that are anti-aging and work!!! Check out my Beauty Counter link for more info!! You will love it! !